The weather is finally with us and both weekend dates look great. We have very interesting events planed for both days this weekend. Details about the Sunday event will be sent in a second email. On Sunday we’ll be sketching with a Musical Theme. We’ll start the day sketching NYC’s “Music Row”l and finish with the special invitation to from the NY Late Starters Orchestra rehearsal. If there is a group which is the musical equivalent of Urban Sketchers, it’s these people. They’re all talented passionate amateur musicians. They have a sister group who play in London. We’ve been invited as their special guests to visit their rehearsal space. 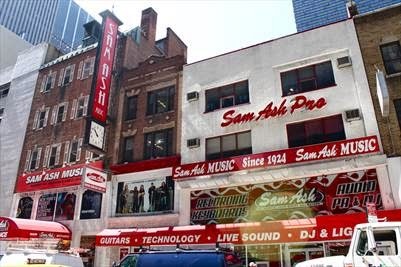 Perhaps Times Square's best kept secret is 48th street, or what locals fondly call "Music Row." Along this street are retailers of specialty instruments, instrument repair shops, and sheet music stores. 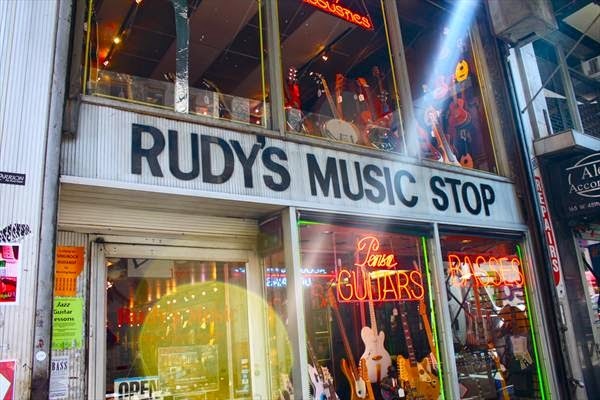 "Music Row" hosts New York City's highest concentration of music instrument stores. Since the early 1930s, "Music Row" has been a center for the musical community, playing host to repair shops and music stores, yes, but also to rehearsal spaces, studios, and musical venues. NYLSO, the New York Late-Starters String Orchestra, is something special. It was founded in early 2007, and grew out of a concept developed by The East London Late Starters Orchestra (ELLSO), an award-winning group in England. NYLSO is an amateur chamber orchestra for beginning or recently returning adult players of violin, viola, cello, and double bass. They are not a class, but rather a highly committed and enthusiastic group of individuals who want to enjoy the experience of playing serious music in an organized group. Sounds a little like us? New York Late-Starters String Orchestra (NYLSO) promo from NYLSO on Vimeo. When: 1:00 PM. Music Row: Meet at the corner of 48th Street and 6th Avenue and we will slowly work our way to 7th Avenue. Everything is on that one block. We will finish at 2:20. NYSLO: At 2:20 we’ll leave to go to the second part of the sketch day. Our visit to NYSLO will be a short walk to their rehearsal space is at Studios 353, located at 353 West 48 Street. If you're coming on your own, ask at the desk, and they'll let you know which studio we are in. >>> Please let us know if you are coming so we can be sure to have enough extra chairs available. Click to send an email to let us know you're coming.